A latest career-related advertisement has been presented in connection with WBSETCL recruitment by West Bengal State Electricity Transmission Company Limited. Hardworking and dynamic Indian citizens are required to submit forms through online mode for the posts of assistant engineer, junior executive, assistant manager, 143 posts, till the last date, which is January 24, 2019. 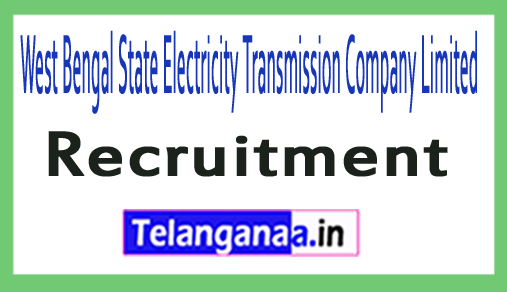 Job seekers who are willing to join this organization can apply against WBSETCL jobs and through this page, WBSETCL Recruitment 2019 can read the full details about the concern of www.telanganaa.in . Academic Description: Candidates must have completed BE / B.Tech / B.Sc Degree / Bachelor Degree / CA / ICWA / MBA / MPM / MHRM / Post Graduation Degree / Diploma (Personnel Management / Hr / Finance and Accounting) or its equivalent . With good marks from a recognized university / institution. Candidates applying for any of the above posts and candidates belonging to General / OBC category will have to pay the application fee. 400 / - (post 1-5), Rs. 250 / - (post 6). SC / ST / PH candidates will be exempted from payment of application fee. Candidates applying for the application must be between 18 to 27 years, 01-01-2019. Monthly remuneration: Rs. Will get the salary of Rupees. 52,650 / - (post 1-5), Rs. 35,500 / - (post 6) from recruitment organization. The selection of applicants for Assistant Engineer, Junior Executive, Assistant Manager will be based on written examination, interview. First of all, candidates will have to go to the organization's web portal, which is http://www.wbsetcl.in. Please read the notification and instructions given in it carefully. Dead line of online application is: 24-01-2019. Click WBSETCL Recruitment Notification here. The advertisement related to a latest career with name in the name of WBSETCL recruitment has been evaluated by West Bengal State Electricity Transmission Company Limited. Eligible and talented applicants can apply for the technical assistant, office executive, 322 vacancies of Linesman by submitting the application form which is before or after the expiry date on 11th January, 2019. Those who want to increase their career in the public sector should apply against WBSETCL jobs and can obtain other relevant details about WBSECL recruitment 2018 from this page, which are equipped with members of dedicated and dedicated team of www.telanganaa.in . Candidates applying for the above post and belonging to the general / OBC category, they have to pay the application fee. 250 / -. Scheduled Castes / Scheduled Tribes / PH candidates will be exempted from payment of application fee. The claimants should be between 18 and 27 years on 01-01-2018. Salary for employees: Technical Assistants, Office Executives, Lansman candidates will be given the benefit of Rs. 34030 / - (post 1), Rs. 25055 / - (post 2,3), Rs. 22605 / - (Post 4) which is offered by West Bengal State Electricity Transmission Company Limited. Selection of interested candidates will be based on the written examination and computer proficiency test / stenography test, their performance in the interview, which will be organized by the recruitment panel. Job seekers who wish to apply for WBSETCL jobs, have to go to the official site http://www.wbsetcl.in. The date of online registration of the application form is to be started: 19-12-2018. Last date for online application: 11-01-2019. West Bengal State Electricity Transmission Company Limited has distributed a vacancy called WBSETCL Recruitment. Bright and qualified Indian citizens can submit their prescribed application form for the 300 vacancies of Assistant Manager, Junior Executive, Engineer, Technician before the deadline of 17 July 2018. Job seekers wishing to apply for WBSETCL jobs can find out more about WBSETCL Recruitment 2018 on this page, which is available to the www.telanganaa.in. Applicants applying for one of the above publications and belonging to the category UR / OBC-A and OBC-B must pay a registration fee of Rs. 400 / -. Applicants from category SC / ST / PH have to pay Rs. 250 / - as registration fee. Participants wishing to join this organization must be between 18 and 27 years of age on 01-01-2018. The reservation in the upper age limit for the reserved categories is made according to the rules of the recruiting organization. Emoluments: Those candidates who meet the eligibility criteria required for WBSETCL vacancies receive a monthly consolidation of Rs. 15,600 - 39,100 / - With 5400 / - Payment Level (Post 1), Rs. 9300 - 34,800 / - With 4700 / - Payment Level (Post 2), Rs. 6300 - 20 200 / - With 4400/2600 / - Payment of the grade (position 3,4) according to the rules of the organization. The selection of jobseekers for previous releases is based on their appearance on a written exam, the interview is conducted by West Bengal State Electricity Transmission Company Limited on the appointed date. Applicants wishing to apply for a vacancy in WBSETCL must visit the official website of the organization http://www.wbsetcl.in. Now check the display and the instructions it contains. After reading the complete instructions, participants must click on the online application link and complete the application form with all the necessary and correct information. Upload digital photos and signature images as needed. Finally, applicants must click on the shipping tab and print out a copy of the application form for later use. The start date of the online submission of the application form is: 27.06.2018. The deadline for submitting the online application form is: 17.07.2018.